Purify Your Body Detox Foot Pads: Glasstic Brand Glass Water Bottles - Unbreakable! Glasstic Brand Glass Water Bottles - Unbreakable! The Glasstic shatterproof glass water bottle is awesome. I only drink out of glass, except on the very rare occasion when I am traveling and need to buy bottled water from a store. I have broken my share of glass bottles. Months later I have found glass shards in the carpet behind my bookshelf! I may not be coordinated but I sure am clumsy! 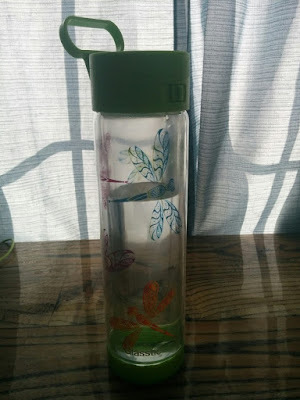 This Glasstic works great because I can put a slice of lemon or lime into the water, or other fruits of my choice, and not worry about the acidity mixing with the plastic. It is pure glass but has a protective outer shell that makes it shatterproof. Well, nothing is completely shatterproof, but if you do happen to run over it with a steamroller, the outershell will contain the glass shards so you don't have a mess to clean up! One of the most common uses for this Glasstic water bottle is to put a drop of your favorite essential oil into your water. Because of the volatile components of the essential oils, they say not to use plastic for sure. This way, you won't have to worry about that. However I do need to note I do not agree with the ingestion of essential oils without proper supervision from someone who knows your medical history and is certified in aromatherapy. That being said, many people do ingest oils, and so if you do, so be it. :) I am not here to judge, but so many people who read my blog know that I don't ingest oils, and so I had to write that disclaimer. Easy to clean: You can disassemble the glass water bottle and clean it by hand, or put in the top rack of the dishwasher. Easy to Use: This has a leak proof flip top cap so you don't have to worry about spilling. I also like it because I just hate leaving my drinks open without a cover. Bugs tend to be drawn to them and too many times I take a sip only to realize a bug is in it! yuck. Take anywhere: These Glasstic bottles have a handle on them for ease of carrying.